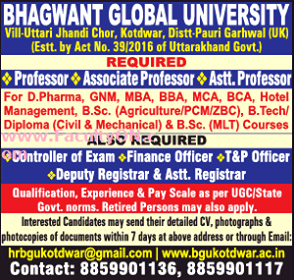 Bhagwant Global University, Kotdwar has advertised in Times of India Newspaper for the recruitment of Professor/Associate Professor/Assistant Professor job vacancies. Interested and eligible job aspirants are requested to apply with in 7 days. Check out further more details below. About College: The Bhagwant Group is being established by a team of professionals and NRI's with a vision of searching talent among rural and urban youth and providing them opportunities to get technical exposure of academic and industrial research. The Bhagwant Group of Institutions is conducting AICTE / UGC / NCTE approved programmes leading to B.E, B.Tech, M.Tech, M.B.A. M.C.A, B. Pharma, M. Pharma, B.P.Ed, B.Ed, B.C.A, B.B.A, Hotel Management & Ph.D degrees.